Winter storm Cleon, record lows: US weather map today is completely insane. You’re laughing today, North Carolina, but just wait ‘til this weekend. I checked my weather app this morning and did a double-take. I have family in both Kentucky and North Carolina, and most days their weather is pretty comparable. Not today. The forecast for Durham is straight out of June, nearly 80 degrees and sunny. In Lexington, just 340 miles away, winter is in full force, with freezing temperatures and “ice pellets” falling from the sky. Then I looked at the whole map, helpfully tweeted this morning by The Weather Channel’s Shawn Reynolds. It looks like something from The Day After Tomorrow—or, as Josh Sternberg joked, a Grateful Dead concert. 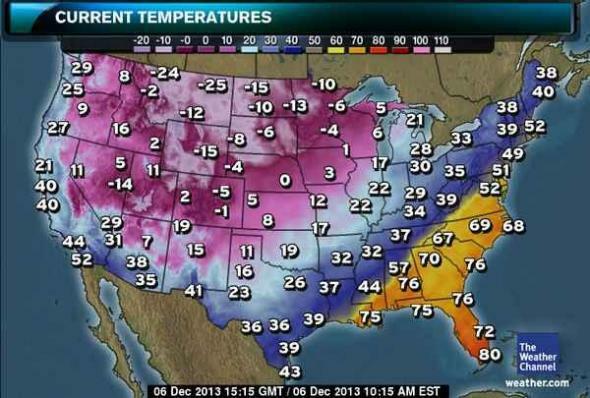 There’s a massive Arctic cold front gripping the entire country—except for the Southeast, which is blissfully balmy. It’s spring in Louisiana and brutal late January in Arkansas. There’s an ice storm in Dallas. And it’s bitterly, bitterly cold across the West, with parts of Montana in the negative-30s. In Laredo, Texas yesterday it was 85 degrees. Now there’s a wind chill of 32. Paso Robles, California hit a record low of 16 degrees this morning, shattering the previous Dec. 6 mark of 23. The differential between the high and low temperatures in the United States yesterday was a jaw-dropping 118 degrees. What the hell is going on? I asked Mike Musher, lead forecaster at the National Weather Service’s Weather Prediction Center, and he assured me that the weird weather is not a sign of the apocalypse, as far as he can tell. Rather, it’s the result of an Arctic air mass descending across the country both earlier in the year and at lower latitudes than usual. While the cold front is moving slowly, he said, it should reach most of the Eastern seaboard by later this evening. So enjoy your sunbathing while it lasts, Durham. Your forecast for Sunday is—you guessed it—a high of 36 with ice pellets.